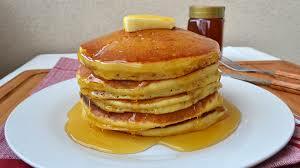 A stack of light and fluffy American -style pancakes this morning will keep me fuelled-up for hours. This recipe has a super batter mix that can't be bettered. If you make it before bedtime and leave it overnight in the fridge then in the morning you can have a breakfast feast in minutes. Stir the flour, baking powder, salt and sugar into a bowl. Mix the milk, eggs and 50g of melted butter in a large jug. Heat a frying pan (cast iron, if you have one), until medium hot, grease lightly with extra butter and pour in the batter in batches to make rounds of 8 to 10 cms in diameter. Cook for 1 to 2 minutes or until bubbles form on top of the pancakes and the underside is golden, then flip each one over and cook for 1 minute. Keep the pancakes warm in the oven while you cook the remaining batches. Heat the maple syrup with 25g of butter in a small saucepan or microwave. Stack the pancakes on warmed plates and pour over the buttery syrup.